Jurgen Krooshoop (Rhodeslover1) made one, earlier this year. A Zorex-220 with Power Functions. All 6 motorized functions (drivetrain, steering, superstructure rotation, boom, dipper and bucket) can work simultaneously. In order to achieve this, two motors were added into the digging arm to operate the dipper and the bucket, which leads to the next entry to this list. 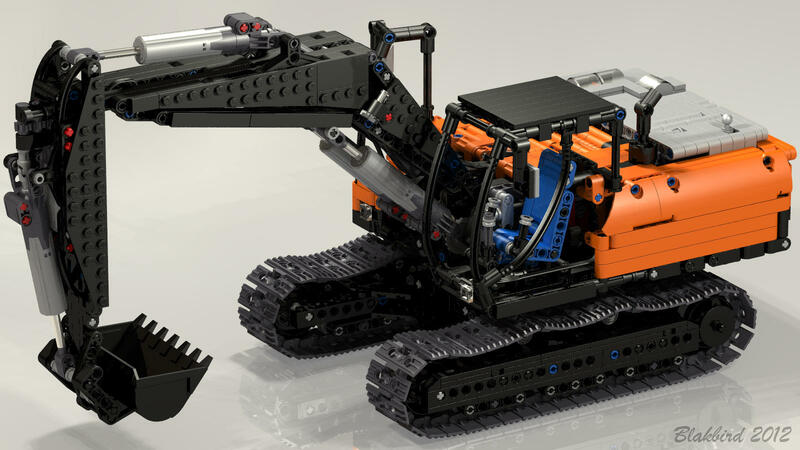 Realistic operating range for the digging arm (boom, dipper and bucket). Full remote control with dual-joystick control. Full 360+ rotation, no wires going through the turntable. Easy access to battery box for switching on/off and recharging (if using the PF rechargeable battery box). You may find a lot more information and images at on Jurgen's Technic Corner. Detailed building instructions are also available for a small fee of 10€. Contact Jurgen to arrange the transaction. To All Builders, If you had the chance to build the 8043(Ultimate), this is way so much better. All the mechanics seem to be "stuffed" in a smaller superstructure and the range of the Dipper & Bucket are very improved. My hats' off to this very talented designer, you must build his models to appreciate his great skill in using Lego pieces in many combinations.